Perhaps this is why some people are prepared to spend thousands of dollars on a mattress that has all the latest in comfort technology. Perhaps that’s also why there are manufacturers on the market that bring affordable mattresses to the market that have just the same effect as those that cost so much. You may notice I have used the word “mattress” here instead of mattress topper or pad, and considering you’re reading my section on mattress toppers you might be a little confused. But the reason for this is that I happen to think the mattress pad I’m about to review for you can do a very good job at both, or at least the 4 inch will. The model I’m talking about is the Soft Sleeper 5.5 memory foam mattress topper (or pad depending on which way you prefer to term them). This mattress pad has been constructed (in the USA!) 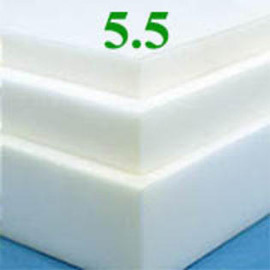 using the next generation in memory foam technology in the form of 5.5 visco elastic foam. The memory foam used is heat sensitive so it keeps you cool in summer and warm in winter. I happen to love this feature because heat is a common complaint I come across with both memory foam mattresses and toppers, and this is one of the first mattress pads I’ve come across that has incorporated heat sensitivity into their design. What I like most about this mattress topper, and this is where I get to the fact you can use this as a mattress if you want to, is it contours to the shape of your body (unlike a lot of other brands out there that just create additional padding). This means you can use this mattress pad over the top of your existing mattress, or, if you want to it will serve you well on top of a futon, sofa bed, airbed and even a camper. Although I will point out that you should be careful with the sizing in this respect. I have used the 4 inch model as an example for the main review here, and considering it’s a 5.5 density you can expect a softer than average result when you lie on it. This is also worth noting if you suffer badly with back or neck pain. This one is available in: Twin, Full, Queen, King, California King and Twin XL. Plus, Soft Sleeper are so confident you will love their mattress topper, they offer a 100 night sleep trial and if you decide you like it, you can expect a 10 year limited warranty. Of course, this depth will benefit those of you who prefer a firmer feel underneath you when you sleep, so if you are a side sleeper and are considering this mattress topper (or any for that matter) for the first time, I would recommend you take a look at the 4 inch. That said this is still 5.5lb density so it will offer the same sort of support as the 4 inch. The 3 Inch is also available in the same sizes as the one above, however you only get a 30 night sleep trial as oppose to 100. The limited warranty is the same though. What surprised me when I first took a look at this size in the Soft Sleeper range is you get what they term as a “shredded” pillow in with the price. Not just that but it’s huge! The manufacturer certainly hasn’t “scrimped” on the foam they have used inside the included pillow. In fact, it may take a bit of getting used to in the beginning. There are a couple of points I would like to make that refer to all of the above depths. The first is that none of them come with a cover so be prepared to factor this into the cost if you want your new mattress topper to stay clean. All of the materials used as I have mentioned come from the USA and don’t contain any potentially toxic ingredients, and when you first receive your mattress topper it should be allowed to expand (at the manufacturers recommendation) for 72 to 96 hours. During this time, you might get an odor that can last anything from a few days to a few weeks. However, this is in no way hazardous to your health. If it does bother you, try airing the room and maybe spray with a little febreeze. What I will point out, and this is possibly the most important aspect for many of you, is the price may leave a few of you feeling skeptical. However, you only have to take a look at Amazon to see there are far more very satisfied customers than unsatisfied. O, and if you’re interested in the 3 Inch: here it is. The 2 Inch can be found here.